The weather outside may be frightful, but this Hopscotch Rug would certainly be a delightful home addition for your kids — and we bet most adults won’t be able to walk past it without putting a hop in their step. 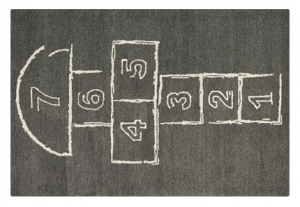 Created exclusively for CB2 by their Italian design team, A/R Studio, the aesthetic of the Hopscotch Rug is reminiscent of an actual sidewalk a child might chalk up on a whim for a quick game. The grey/brown color scheme marked by cream colored ‘chalk’ makes this rug a playful, yet seamless addition to adult decor — blending in and standing out simultaneously!